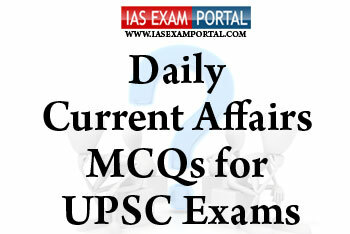 Current Affairs MCQ for UPSC Exams - 26 JANUARY 2019 | IAS EXAM PORTAL - India's Largest Community for UPSC Exam Aspirants. 1) The US government retained the top spot as the world’s largest public funder, providing an additional 1.5% ($23 million) for a total of $1.6 billion. 2) PSLV-C44 mission was unique as it was for the fifth timecontinously ISRO used the last stage of the rocket as a platform to perform experiments in space. 1) As per the findings,India’s growth is expected to be in the 7-7.5% range in the next few years; one of the fastest in the world. Q5. It is located between the Guardafui Channel and the Arabian Sea. The territory is located near major shipping routes and is officially part of Yemen, and had long been a subdivision of the Aden Governorate. The island is very isolated and home to a high number of endemic species; up to a third of its plant life is endemic. It has been described as "the most alien-looking place on Earth. The above description refers to which of the following islands of the Indian ocean ?